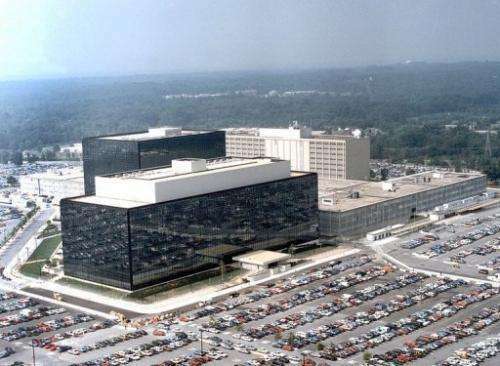 An undated handout image received on January 25, 2006 shows the US National Security Agency (NSA) headquarters at Fort Meade, Maryland. The Obama administration on Wednesday declassified a court order authorizing collection of millions of US phone records, even as it faced new disclosures about the reach of its secret electronic surveillance programs. Under mounting pressure from lawmakers, Deputy Attorney General James Cole said the newly declassified order spells out how the government can use the call data obtained from telecom giants like Verizon. "The terms under which the government may access or use the records is covered by (a) detailed court order that the DNI declassified and released today," Cole told senators. That primary order "provides that the government can search the data only if it has reasonable articulable suspicion that the telephone number being searched is associated with certain terrorist organizations." The move to confront growing public and congressional opposition to the secret programs came as the administration faced new disclosures from Edward Snowden, the former intelligence contractor at the heart of the controversy. The latest documents obtained by him and published by the British daily the Guardian revealed the existence of a secret surveillance system known as XKeyscore that allows US intelligence to monitor "nearly everything a typical user does on the Internet." The Guardian said the hitherto secret program was the most wide-reaching operated by the National Security Agency. XKeyscore's existence proved the truth of Snowden's earlier claim, denied by some US officials, that before he quit the NSA he could "wiretap anyone, from you or your accountant, to a federal judge or even the president, if I had a personal email," it said. Snowden, who is now stranded in the transit area of a Moscow airport, fled the country after downloading NSA files that have made for one bombshell disclosure after another. 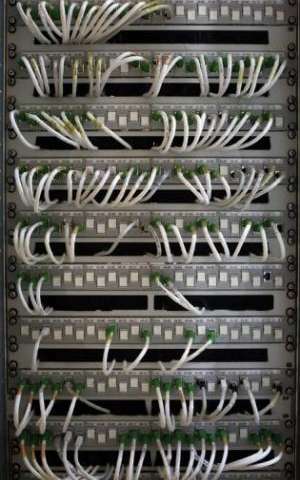 File picture for ilklustration shows telecom network cables. The Obama administration on Wednesday declassified a court order authorizing collection of millions of US phone records, even as it faced new disclosures about the reach of its secret electronic surveillance programs. Since he disclosed the vast scale of the electronic surveillance operations in June, public sentiment in the US has shifted against them. But the panel's chairman, Senator Patrick Leahy, sharply questioned the usefulness of the information gathered. "If this program is not effective, it must end. And so far, I am not convinced by what I have seen" Leahy said. Officials said the data gathered from the program has contributed to the disruption of 54 terror threats or events, including 13 on US soil. Deputy FBI director Sean Joyce insisted that the telephone data program, authorized by the Patriot Act that came into law shortly after the 9/11 attacks of 2011, has played a crucial role in "closing the gaps and seams" of intelligence gathering. "We must have the dots to connect the dots," Joyce said. Leahy was not buying it, saying there would always be more "dots" to collect and analyze. "The government is already collecting data on millions of innocent Americans on a daily basis, based on a secret legal interpretation of a statute that does not on its face appear to authorize this type of bulk collection," Leahy said. "What will be next? And when is enough, enough?" During the occasionally tense hearing, the counsel for the Director of National Intelligence said the White House has willing to consider changes to the how the secret program is conducted and publicized. "We are open to re-evaluating this program in ways that perhaps can provide greater confidence and public trust," said DNI general counsel Robert Litt. Leahy appeared to welcome the approach, adding that "there are going to be some proposals to changes in law." But his Democratic colleage Dianne Feinstein, chair of the powerful Senate Intelligence Committee, warned against efforts that would severely hamstring US phone or Internet data collection operations. "We would place this nation in jeopardy if we eliminate these programs," she said.